I’ve never seen a buffalo fly, but Buffalo Style Wings have been made their mark as a favorite appetizer and party fare. It wasn’t long ago that wings were just scraps relegated to the stockpot for making broth or soup. With the commercialization of chicken harvesting, consumers opted for the better portions of chicken, the breasts, thighs and leg portions, the wings ended up going to soup factories. There is much debate about who actually came up with the recipe for hot chicken wings, but the consensus points to the Anchor Bar in Buffalo, New York. The story goes that back in 1964, the owner of the bar had to feed a group of her son’s friends and with a bunch of wings on hand, deep fried them and then tossed them in a buttery chili sauce and served them with bleu cheese dip and celery. The wings were a hit!! The City of Buffalo has designated July 29th Chicken Wing Day. And as a matter of record, the Anchor Bar serves 70 thousand pounds of chicken monthly! This recipe combines the sweetness of the yam with the spiciness of the chicken and then finished with the coolness of the yogurt-bleu cheese topping. Coat a slow cooker with nonstick spray and place the chicken in the bottom of the cooker. In a separate bowl, add the hot sauce, garlic powder, cayenne, salt, pepper and coconut oil and microwave for 45 seconds and then stir. Pour the sauce over the chicken breasts and cover the slow cooker. Then cook for 1½ hours on high until chicken is fully cooked. 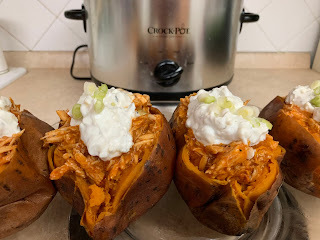 While the chicken is in the crockpot, prepare the sweet potatoes. Coat with butter, wrap in foil and bake in the oven at 400° for 45 minutes. Leaving the sauce in the crockpot, remove chicken from slow cooker and shred with a fork on a separate plate. In a separate bowl, mix the cornstarch with the water and pour back into the slow cooker with remaining hot sauce. Combine using a whisk. Cook sauce on high for 30 minutes. Add shredded chicken back into the slow cooker and toss it well into the sauce so that it is entirely coated.